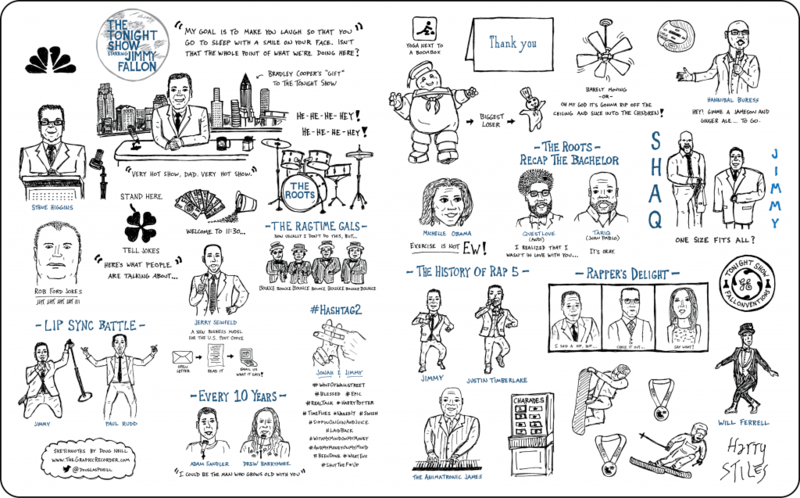 In this sketchnote I give a shout out to Jimmy Fallon and capture some of the best moments of his first two weeks hosting The Tonight Show. Purpose: To practice drawing people and faces while pulling out some of my favorite bits from the first two weeks of Jimmy’s tenure at The Tonight Show. A few months back author, designer, and sketchnoter Mike Rohde asked me if I had done any sketchnoting of TV shows or movies to incorporate into his new book The Sketchnote Workbook. I’d sketched a few interviews on The Daily Show and a few Spanish-language movies, but I wanted to give something else a try. I wanted to have a little more fun and freedom. The timing of Mike’s request worked in my favor. It came just as Jimmy Fallon took over The Tonight Show, and I was enjoying watching what he brought to the legendary late night stage. I decided to take the opportunity to practice an area of weakness for me – drawing people and faces. The first two weeks of the show gave me plenty of opportunities to do just that. Even months after the fact, I still remember all of the bits that I captured in the sketch above – one of the many benefits of sketchnoting. Special thanks to Mike Rohde for the invite to contribute to The Sketchnote Workbook. Pick up a copy for yourself here. And if you haven’t already checked out The Tonight Show Starring Jimmy Fallon, you’re missing out on some good stuff.